At 74 years old my mind is slowly deteriorating. I don’t know if it is merely senility, possibly due to ingested medication, or it could be early stages of something more sinister such as alzhiemer’s disease. At any rate I intend to assess myself as closely as possible and blog of it from time to time for the benefit of those who will find themselves in the same situation sooner or later. Most of the time my brain seems to function as well as it ever did, but there are times when I seem unable to concentrate to the degree I once was able to. It is not unusual for me to lose a train of thought in midstream any more. The slightest distraction while I am speaking about any topic may cause me to lose the thought immediately. There are times, which come more often as time passes, when I cannot remember how to do the simplest task which I may have been familiar with for many years. For instance, I may want to read the CNN news on my PC. I automatically open my browser. I then automatically open my “favorites” folder. Then possibly for a few moments I seem unable to know what to do next. CNN is not there. Oh, I have a folder labeled “News,” I must open that, and then there is a subfolder labeled CNN. The few moments of hesitation is the newcomer to my life. It used to be entirely automatic to go through that process where I now have to think about parts of it, with a lessening ability to think. I have heard it said that older people seem to want to live in the past. I think now that it is not so much “want to live in the past” as it is forced to live in the past. I can remember an event from December 1941, and another from January 1942, both decidedly very traumatic, yet still recallable although I was only around 3 ½ years old at the time. In the meantime I can’t remember things that have happened much more recently. I tend to live in the past because it’s all that I remember. More another time if I remember to blog about it again. Imagine a raindrop’s traverse to the sea. The drop falls, and another, and another. They touch, form together, and become a puddle. The puddle then spills over its edge and begins to move ever so slowly downhill. It will mingle with other raindrops forming small rivulets, which in turn will change into creeks, streams, and eventually into a mighty river. Although the droplets are ever new, the river remains stable. Life is like that mighty river flowing to the sea. It goes on, incessant, never-ending, forever and ever. We are born, and another is born, and yet another. We jump into the stream of life swimming along like fish to the best of our ability. An individual comes and goes, is born and dies, but the stream of life keeps passing by. Some like to think they made a big splash when they entered the stream, while others are just content to be borne along, and eventually complete the journey. In either case, all find that the trip only lasts for a fleeting instant in the grand scheme of life. The river continues to flow for eons unending. Whether it is your parent, yourself, or your child in that stream, makes little difference, the stream is incessant. You are really but a drop of water along the path of that mighty river, but the river of life flows on forever. Called out at 2 a.m. to repair a faulty furnace, by 4 it had been a long night. By 6 it was even longer, but that is about when I finished the repair and started the 35 mile trip back to the garage at the company where I worked. Did I mention it was bitter cold? The outside temperature was somewhere below zero, and there had been a frosty spit of snow during the night. In a hurry to see an end to this escapade I was traveling faster than conditions warranted even though that was yet less than the posted speed limit. As I traveled along on a city bypass highway I saw in the distance a large truck in the opposite lane heading my direction. As I approached it I could see it was a snowplow, and further that it was stopped in the opposite lane. I slowed somewhat as I got still nearer, but not seeing any other moving vehicle I was yet moving along at maybe 40 mph. As I neared enough to go by it suddenly a car pulled into my lane from behind the truck, its driver attempting to pass the stopped vehicle in his lane. I couldn’t move into the truck’s lane, nor could I remain in my own, so I headed for the ditch on my side of the road. As I entered the 3 foot high bank of snow on the side of the road the violently flying snow instantly covered my windshield. I entered the ditch at an angle, held on to the steering wheel for all I was worth, and hoped for the best. It seemed like forever, but in actuality was no more than a few seconds until my pickup came to a halt. All of my body parts seemed intact and still attached. In a heated cab I had been driving with my coat removed. My first thought was to put it on. Then I attempted to get out of the truck to assess where I was, and what I was going to do about it. The door wouldn’t open easily. It opened a few inches and stopped against hard packed snow. I closed it and opened it again more forcefully the second time. I gained a couple of more inches. I tried again, and this time a hand from outside grabbed the top of the door and helped me pull the door open. By that time the adrenaline was slowing down. I asked Larry for a ride to an all-night restaurant down the road a bit. He complied, and from there I called my workplace. I told them to call me a wrecker, but they sent a large company truck instead. When that truck arrived the driver phoned our workplace again and proposed they call a wrecker, which in due time arrived. The wrecker towed me to the local Ford dealer as I was driving a Ford pickup bought from them. They took my truck in, melted snow off of it using a warm-water hose for a half hour before thoroughly inspecting it for any damage. Free of any damage I went on my way, and took the rest of the day off from work. So it was at age 15 I would belly up to the bar, order a “Jenny,” and enjoy myself with the big boys. This continued until I became 17 years of age at which time I joined the United States Navy and left my hometown for a spell. I next spent some time on Oklahoma where I learned the pleasure of sipping seven and sevens, that is, Seagram’s Seven Crown fine sipping whiskey mixed with Seven-Up soft drink. Next I found myself located in Tennessee where I learned that some wines were awfully good, not necessarily good for me, but yet good. Time kept passing, as it always does, and after a few months I went to spend some time in Pensacola, Florida. Here, they had never heard of “Jenny” so I learned to appreciate the taste of Schlitz beer. I had only recently attained my 18th birthday. I continued to research the taste of Schlitz, mostly on-tap, through stays in Quonset Point, Rhode Island; Argentia, Newfoundland; Chincoteague, Virginia; Norfolk, Virginia; Jacksonville, Florida, and a few places in between. After three years in Jacksonville, I turned 25 years old in the summer of 1963, and on my birthday I left my wife and baby with her mother as I proceeded to travel to Guantanamo Bay, Cuba. When I arrived there I learned that there was no United States tax on liquor. Now that made for an interesting situation. Some of the finest Canadian whiskey ever produced in my opinion, Seagram’s Crown Royal, was about the same price as beer in the United States. I left beer in favor of sipping whiskey again. I spent three years in that utopian atmosphere of Gitmo, and during that length of time I learned it was impossible to drink all of the Seagram’s Crown Royal that could be produced so I gave up trying. They beat me. Other than an occasional beer with a friend, like one every five years or so, I’ve never drank alcohol since. Once upon a time I had a son. A bit misguided he joined the United States Marine Corp, and spent a few years of his life, mostly during the 1980s, attached to that organization. I still have the son, but, having finally seen the error of his ways, he is no longer a Marine. At one point in his shortened military career he opted to leave North Carolina to visit his parents at his boyhood home way up in northern New York. All went well and he duly arrived at his destination to stay for a while enjoying a well-earned spell of rest and relaxation. Did I mention that northern New York is often cold in the fall and winter, and so it was at this time. One bright, clear, cold morning he set out in his trusty white pickup truck on the return trip to North Carolina. He was doing fine until he got a few miles south of Syracuse. There is a section of I-81 there that has a long stretch of guard cables atop a steep hill. While traversing that chunk of highway he attempted to pass over an ice covered spot. He was unsuccessful. Suddenly his pickup was riding along the guard cables checking them for strength. When it came to a stop, although it was not terribly damaged, it was no longer drivable in its present condition. What to do? Call Dad, of course, that’s what fathers are for. Knowing he had not too many extra hours to reach his Marine Corp Base in North Carolina it was imperative we get him back under motion, headed south, as soon as practicable. It just so happened that we had relatives in Cortland a few miles down the road. My brother Ron’s boys, Victor and Rick lived there among others. Soon they arrived to take his pickup under tow to Cortland. After assaying the situation they believed it impossible to get the pickup drivable again to continue the Carolina trip. So nephew Rick loaned my son an automobile which he drove to North Carolina. Ultimately, as I recall, they traded vehicles, but we are ever glad that with little hesitation our relatives once more “did the right thing” and Wayne made it back to his duty station with some time to spare. Let’s begin with Joseph Pratt Lawton, born in 1833, and his wife the former Jane Wilson, born in 1835, both of Jefferson County, New York. After their marriage in 1856 they were the parents of 11 children, among them my grandfather Will born in 1866, and his younger brother Charles born in 1875. Charles married Mary (Malina) Noody in 1900, and they had 14 children, among them a son Ralph Gerald Lawton born May 7, 1904. Will married, as a second wife, Cora Baker, and they had three children together, among them the first born Lloyd August 27, 1905. Thus Lloyd, my father, was a first cousin to Ralph. 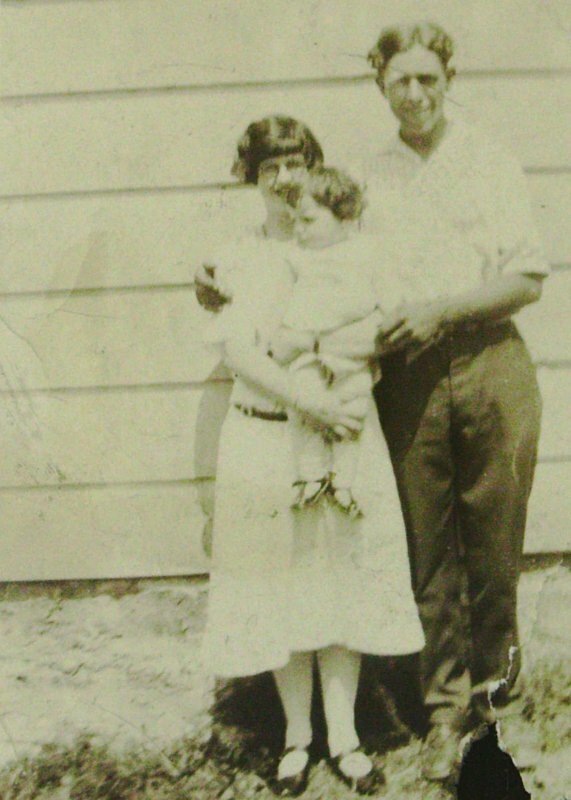 On June 20, 1925 my father Lloyd wed the former Alice Halladay born May 1, 1906, and raised also in Jefferson County. Not to be outdone, the following month, July 17, 1905, first cousin Ralph married Alice’s younger sister Grace. Just bear with me. After all, this tale started in 1833, and already we’re up to 1925. The accompanying photo is of Ralph Gerald Lawton and his new wife Grace in 1925. She is holding her oldest sister Elsie House’s first born child, Evelyn, born March 4th the previous year. Ever onward. About the year 2000 I was traipsing through a cemetery one day when what should I spot but a tombstone with Ralph’s name on it. I previously knew he had been killed in a farm accident in 1930, but had no idea where he was buried. Now I knew. Maybe three years or so later Ralph and Grace’s son Eugene asked me if I had any idea where his father was buried, and if so would I give him that information. He had no knowledge of his father’s final resting place as he was only two years old at the time of his father’s death, and had been raised by his mother and stepfather in another county. Knowing the exact place of burial, I drove Gene to the cemetery about an hour away from my home, and pointed out the tombstone to him. Tears rolled down his face as we stood there gazing down, and then we drove back to my home. I never saw nor spoke with him again before his death nearly two years ago. About three years ago I realized I had never photographed that gravesite or tombstone in either of my visits so I set out one day to do that. I drove to a cemetery in Plessis, NY where I recalled the site to be, but I could no longer locate it. I paid a return visit later with my grandson as a helper, and we yet couldn’t locate it. I mentioned this to my daughter Donna, and she did some sleuthing on her own to discover he was not supposed to be in the Plessis Cemetery, but in one located in La Fargeville, Jefferson County. I realize due to my advancing age my memory is not as good as it once was so I have, as of now, spent several hours searching the cemetery in La Fargeville all to no avail. I am unable to locate that which I have previously seen, and knew its exact whereabouts. As somewhere around a decade has passed since I last sighted it, it is possible the tombstone has been removed or covered in some manner. Does anyone know where Ralph’s grave is located? I am the father of two boys and two girls. I love them all dearly, but sometimes too much time passes between the times when we meet face to face. Thanks to phones and social media we stay in touch, but it’s just not the same as a hug somehow. This past weekend, August 3 – 5, all four of my children were in my home at the same time. There were also four grandchildren, and three great grandchildren present. Two of the great grandchildren I had never met prior to this. What a joyous time to have them gathered under one roof. The oldest will be fifty years old later this year, but in our family they are all yet my children. There is no such thing as adults that have left the nest. They are all my children and they remain forever in my heart. To add to the happiness on Sunday afternoon two of my three remaining siblings spent some time with us, as well as a sister of my wife and her husband, my fishing buddy. A few of our other nieces, nephews and assorted others heard that my children would be here so they joined in an outdoor picnic with us. It wasn’t a family reunion, but it sufficed for our immediate family. I hope we can do it again, maybe next year. Thank you to all that attended, and an especial thanks to DJ for all her efforts in planning and producing this extravaganza.